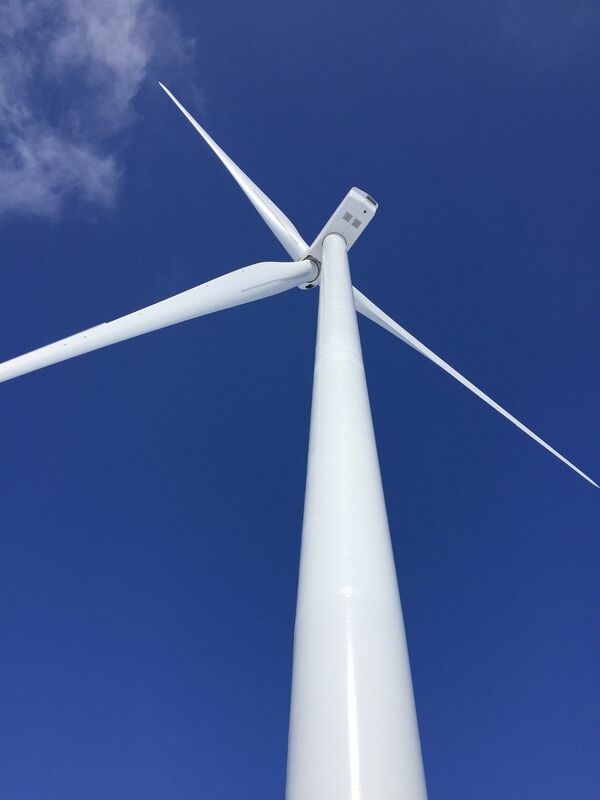 CALGARY, AB--(Marketwired - June 10, 2016) - BluEarth Renewables Inc. ("BluEarth") celebrated the official commissioning of the Bull Creek Wind Facility ("Bull Creek") yesterday. Bull Creek is the first of BluEarth's renewable power projects in Alberta to become operational. The afternoon celebration brought over 80 stakeholders to Bull Creek's site near Provost, Alberta; including school board representatives, David Shepherd MLA for Edmonton-Centre, project landowners, vendors, contractors, community members and BluEarth staff. The celebration centered on Bull Creek's unique relationship with many of Alberta's rural schools. Electricity generated by Bull Creek is sold to 25 Alberta school boards through agreements reached with leadership from the Alberta Schools Commodity Purchasing Consortium ("CPC"). The CPC ran a competitive process to select a renewable power developer to provide its members with an option for a long-term, low-impact affordable source of electricity. BluEarth was selected as the partner to develop a project to meet the CPC's requirements. "Today's celebration is the result of many years of commitment, persistence, team-work, and visionary leadership on the part of the Alberta Schools Commodity Purchasing Consortium," said Grant Arnold, BluEarth's President and CEO. "I am grateful to the CPC for trusting and working with BluEarth in order to make this uniquely contracted project a reality that will benefit current and future generations of Albertans. I also wish to sincerely thank the communities surrounding Bull Creek for their support over the years." "We are proud to be a part of this important project demonstrating the leadership and innovation for positive environmental impact as your elected School Board trustees," said Tracy McKinnon, Chair of Fort McMurray Catholic Board of Education. "We continually strive to recognize our responsibility in protecting our environment through educating our young people to become environmental stewards, and this project is one example of how this can be accomplished." "BluEarth's Bull Creek Wind Facility stands as a stellar example of the pioneering spirit of innovation and entrepreneurship that built our province and continues to move it forward," said MLA David Shepherd. "This is the kind of leadership that will help build a greener, healthier province and complement our work to transition Alberta to 30 per cent renewable power generation by 2030." "Wind power enables participating school boards to take advantage of the long-term, predictable electricity costs, with no future fuel-price risk," said François Gagnon, Chair of the CPC. "In addition, it limits our exposure to potential increases in costs associated with greenhouse gas pollution from traditional sources of energy production." Headquartered in Calgary, BluEarth is a private, independent renewable power producer, focused on the acquisition, development, construction, and operation of wind, water, and solar projects, with a focus on Canada. With the most experienced renewable energy development team in Canada, BluEarth's mission is to be the renewable energy leader by developing, building, and operating a portfolio that optimizes people, planet, and profit. BluEarth believes it has The Power to Change the Future™ by demonstrating how to be sustainable and profitable, leaving the world a better place. For more information, visit www.bluearth.ca or follow us on twitter @BERenewables. About this company BluEarth Renewables Inc.
Over 80 people gathered in Provost yesterday to celebrate BluEarth Renewables' first commissioned project in Alberta; including landowners, contractors, community members, stakeholders and staff. Power from the Bull Creek Wind Facility is sold to school boards across the province.